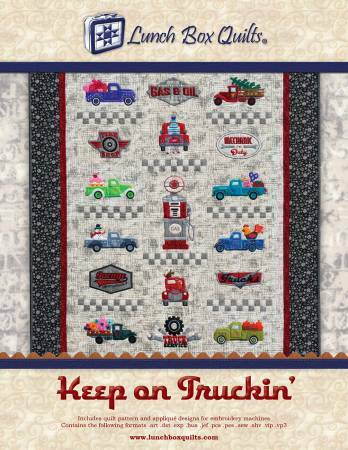 Keep on Truckin' machine embroidery designs from Lunch Box Quilts. Includes the quilt pattern and applique designs for embroidery machines. File formats included are ART, DST, EXP, HUS, JEF, PCS, PES, SEW, SHV, VIP & VP3. Finished size of the quilt is 49" x 64". A smaller wall hanging version of the pattern is also included which finishes to 25" x 39".